$101,000 to the winner of one single class in an Outlaw-style drag racing event. And $50,000 to the winner of the second class at the event. 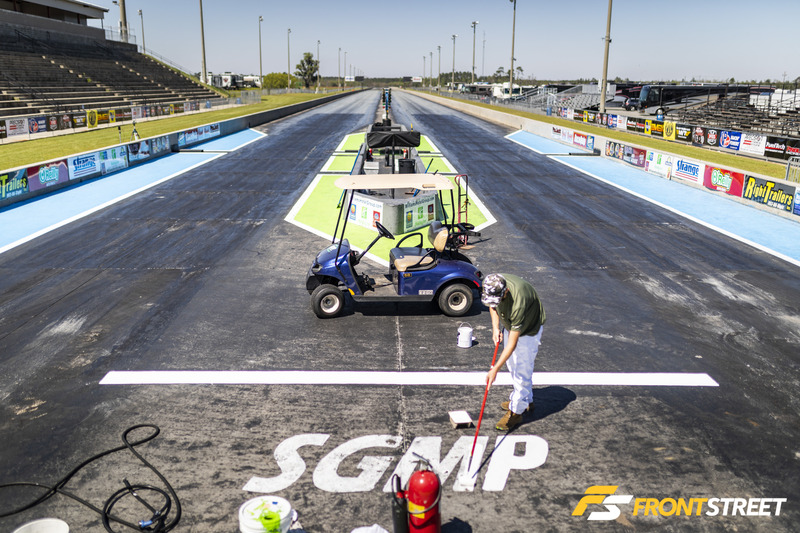 That’s a massive amount of money for a style of racing which wasn’t more than a blip on the map a decade ago, and that’s why all eyes in the drag racing world were on the Sweet 16 2.0, which just took place at South Georgia Motorsports Park. Duck X Productions invited the finest racers in the world who compete on radial tires to test their abilities on a killer track and against the best competition in the radial racing arena. The guaranteed payouts drew the best of the best to the middle of nowhere for one wild and crazy weekend full of intense, hard-fought racing full of twists and turns. Rather than recap the action, which was available on a Speedvideo pay-per-view live feed and has been reported by many other outlets, I’d like to talk about my experience—and the performances which stuck out to me as impressive for one reason or another— at what I consider the greatest radial race ever held. In the weeks leading up to the race, promoter Donald Long continuously repeated the mantra Come Witness History, and that’s exactly what I was able to do. I’ve covered hundreds of drag racing events promoted by many different sanctions—the NMRA, NMCA, Yellow Bullet Nationals, Street Car Super Nationals, NHRA, and others—for the better part of two decades, and it’s been a long time since I have been this excited to go to an event. There were so many outstanding performances and personal-best passes at this event that it’s impossible for me to cover everything. Warning: this article will be long, so settle in and enjoy the ride! I promise there’s a payoff in the form of a great photo gallery at the end. My excitement was tempered on the first day of the event. After pulling into the track, I was told to park wherever there was room, so I did. Several hours later, when I was done shooting photos in the tech line and talking with several racers, I returned to my parking spot—and no rental car anywhere. It seems I had parked in the prime spot which was assigned to Lights Out X Radial Vs. The World winner Alex Laughlin, so the track staff towed my car to the top end and left it on the rollback to teach me a lesson. I had to be a good sport and let Jim Dyas snap these photos of Duck X security chief (and tow truck maestro) Steve Sapp and myself before I was allowed to have my rental car back. Lesson learned… I parked somewhere else for the rest of the weekend. It sure was funny, though. All eyes were on a couple of competitors: Kevin Rivenbark (pictured) and Tim Slavens. These two had battled back and forth at the Lights Out race one month ago, chasing one another to be the first Radial vs. The World competitor to break into the 3.50s in the eighth-mile. Coming into Sweet 16 2.0, it was anyone’s game. Once the killer conditions of the night session rolled around on Thursday, Rivenbark rushed right to the front of the pack as part of the first pair down the track, where he put the big number on the board and ended all of the speculation. Rivenbark’s Galot Motorsports/Pro Line Racing/ProCharger/FuelTech-sponsored car is a collaboration between some of the most prominent companies—and brilliant minds—involved in this style of racing. Breaking records (and milestones) has always been the name of the game for these companies, and with the help of supertuner Steve Petty and the rest of the team, Rivenbark delivered the goods. But knocking the clocks down with a 3.58 to become the first RvW racer in the 3.50 zone was just a preview of his weekend. By the end of eliminations on Saturday night, Rivenbark had run through the entire RvW field with an incredibly consistent race car. How consistent was he? During four rounds of competition, his elapsed time spread was .035-second. .035-second across four races, on a radial tire sticking thousands of horsepower to the track, in both day and evening conditions. It’s always been said that consistency wins races, and in this instance it’s no different. On the way to the big payday, he knocked out racers Marty Stinnett, Ken Quartuccio, Mike Stavrinos, and Norman Bryson. There wasn’t a single easy race in the grouping. Speaking of Bryson, his may have been the feel-good story of the weekend. He slid into the 13th qualified spot ahead of Brad Edwards, Marty Stinnett, and Tom Blincoe, then ran 3.72 and 3.73 to knock out heavy-hitters Jeff Sitton and Stevie Jackson in the first two rounds of competition on Saturday. A pedalfest in the semis against Daniel Pharris went his way before he finally went down to the Rivenbark juggernaut in the final. I remember just a few short years ago (2015 to be exact) when Kevin Mullins delivered a 4.11 in RvW trim and people thought the 3s might never occur. Here we are four years later—almost to the day—and Rivenbark is running half a second quicker, with a bump spot for the top 16 cars at this event sitting at 3.691. Just an insane showing all around! Slavens, to his credit, battled all weekend long despite not even making the field for the Sweet 16. Just one month ago, Slavens shocked the world with the Wolverine Camaro, busting out a 3.61 in the search to be the first racer into the 50s. This time, though, it was not meant to be, as the team continued to fight the care through each and every qualifying session, eventually experiencing a big boom at about the 330-foot mark on Friday night. They traced the problem to a broken fuel injector wire, subsequently pulled the engine and repaired it. Additional precision bodywork was performed to the nose of the car and they persevered on Saturday, eventually falling to Second Chance race winner Steven Fereday… who has an incredible story of his own. Hurricane Harvey impacted Fereday and the folks down at Late Model Racecraft pretty heavily, which has kept his familiar blue Camaro out of commission for the last two years. Although the car sat for a while, Fereday was anxious to get back to the track, and he finally completed the car just a few days before Sweet 16. The plan was simply to enter the event to be able to gather data on a good track surface, but they were able to achieve much more. With the help of teammate Josh Ledford and many other people, Fereday went on to capture the win in the RvW Second Chance race by running consistent 3.70s and taking out Mark Woodruff in the final round. Fun fact: this is Steven’s high-school car which has seen more than a few street races—and wins—in its day. So with all of the focus on the First to the 50s, consistency and race-winning performance of Rivenbark, the actual RvW record is held by Daniel Pharris, who used the top-notch race conditions at Sweet 16 to record a 3.578 blast. With the help of tuner Jamie Miller setting the car up for success, Pharris’ performance cannot be discounted heading into the meat of the 2019 season. He made it to the semifinals of the Sweet 16 before falling to runner-up Norman Bryson. Marty Stinnett is punching way above his weight in Radial Vs. The World, with a small-block Ford/backhalf car competing against converted Pro Mods—and he’s holding his own in the process. Stinnett pushed his way into the Sweet 16 and set the small-block record to 3.651, but went down to Rivenbark in the first round of competition on Saturday. 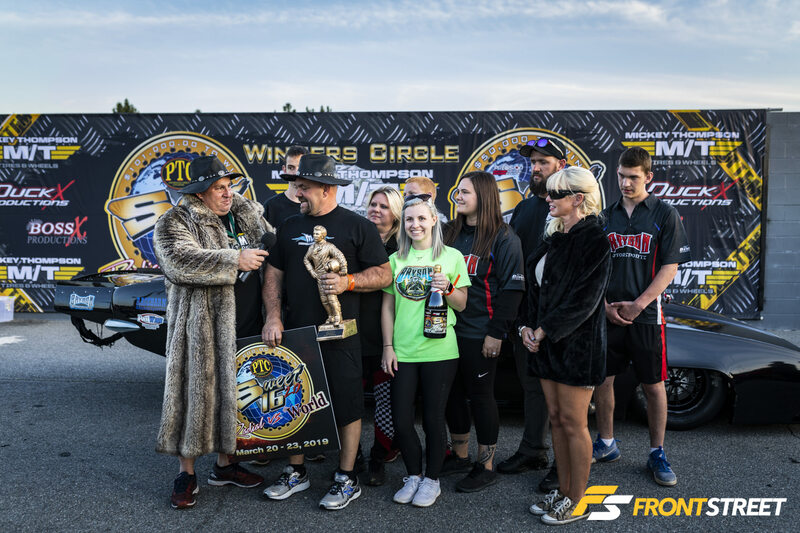 There’s no way to ignore the performance put on by racer Marcus Birt, who achieved the monstrous feat of becoming the quickest and fastest nitrous-assisted doorslammer driver on the planet at the Sweet Sixteen. The 3.604 he ran during the qualifying sessions shocked everyone on the premises, but the conditions were ripe for this kind of performance. But Birt didn’t stop there; after the car ate the engine later in qualifying, he put in a phone call to engine builder Pat Musi, who got out of bed at 11PM, went to the Musi Racing Engines shop, put an intake onto another engine, then enlisted one of the shop employees to drive all night and deliver it to Birt. Sadly by the time eliminations began, Birt was out of the show, but it certainly wasn’t for lack of trying to make it. Racers will bet on anything, even a footrace. Over ten years ago, John Sears had the idea to put together the X275 class, and here he is standing in front of an assemblage of the quickest field the class has ever produced. So quick, in fact, that there is one incredible feat which deserves to be highlighted above all else. The top 16 qualifiers at the Sweet 16 were all quicker than the number-one qualifier at Lights Out X, just one month ago. The radial tire revolution is happening quickly, and while I am definitely a fan of this type of racing, I have to wonder where it stops. Or at least reaches a crescendo, where the performances quit jumping barriers by leaps and bounds in what seems like minutes. But it wasn’t just the top 16 X275 qualifiers who were quick. The top 51 qualifiers at Sweet 16 were within one tenth of a second of the Lights Out X top qualifier. Number 51 was Jon Thomas, in his 2002 Camaro, who recorded a 4.449 here at Sweet 16. The number-one qualifier at LOX—Shane Fisher—had stopped the clocks at that event with a 4.349 during qualifying. So when I say the level of competition at this event was insane, that’s exactly what I mean. Once you were outside the top 16, the next 17 racers were bunched between 4.348 and 4.398. 17 guys stuck in a .05-second range! That’s simply mind-boggling to me. This race truly brought out the best in everyone. The top 39 racers ran 4.405 or quicker in qualifying, which would be good enough to be top qualifier at many X275 racers across the country. I don’t even have the words to explain how incredible of an achievement this is for the entire field of racers. Speaking of Sears, Roger Conley, Lonnie Grim, and the rest of the tech team for Sweet 16, I think they did a masterful job of checking and teching all of the cars, especially the blower and turbo cars in X275. In the weeks leading up to the event, he had go/no-go templates made for the impeller wheels and other critical dimensions of these components. During tech time on Wednesday and Thursday, he was measuring each of these, then placing a numbered seal on each to ensure the racers stayed honest all weekend long. Because racers by nature are an honest bunch, right? What else can I say about the Bruder brothers? Nick and Rich are quickly becoming legends for their work ethic, talent, and sheer will to win. No matter what obstacles are thrown in front of them, they just continue to put big numbers up and win races. Rich closed out the team’s $50,000 weekend with a record-setting pass in the final round of X275, lowering the number to 4.235 and eliminating Craig Walls in the process. Oh… he also took out Clint Downs, James Lawrence, and Shane Fisher before meeting Walls for the big payday. What a killer weekend! Rob Goss set the class record at the end of qualifying down to a 4.237 with a monster hit, although it was eclipsed by Bruder’s final-round showing. I chatted with Rob for a while on Saturday and he was feeling ready to take on all comers. He made it to the semifinals before a parts failure ended his weekend. Side note: the ProCharger-boosted Gen III Hemi in his Challenger takes a plug change after every run—16 plugs at a time. When I shot this feature, Ryan Milliken was having a ton of difficulty finding his way with his X275 Nova. People didn’t give him any credit for trying to compete in the class, but he stuck with it, making lap after lap after lap at Emerald Coast Dragway, which he runs, and many other facilities trying to find the sweet spot. And when he turned on the boards with an incredible 4.28 on Friday during qualifying and made it into the X275 Sweet 16, the collective jaw of everyone in attendance fell on the ground. By enlisting help from Menscer Motorsports to sort out the suspension and adding more power, he picked the car up a whole bunch in one shot. Even though he went down to Shane Fisher in round one on Saturday, just the fact that he’s been able to figure out how to make this car—and engine combination—work in this class is astounding to everyone. We need this kind of innovation in heads-up radial-tire drag racing. Seriously impressive to me were the exploits of Titan Motorsports’ Nero and Baadal Deliwala, along with driver Gary White behind the wheel of the team’s ‘94 Supra. Why? Because 2JZ, that’s why. Obviously the engine is nothing to look past, but the talents of these two teams—and the efforts they made to compete in the strongest X275 field ever—will make people pay attention moving forward. Gary White pushed himself right into the middle of the Sweet 16 field by qualifying with a 4.307… at 174.55 mph, the highest speed ever recorded in X275 competition. But the real reason the car turned my head is because it’s using a Liberty transmission and a clutch, which makes it the only car in X275 competition that I’m aware of with this setup. And the sound of the 2J under power as he blasts by me on the track is something quite magical. Although Park only mustered a 4.42 blast to land in the 45th qualified spot, he still acquitted himself well by qualifying ahead of some pretty big names. With continued focus on the class it’s not unreasonable to think he’ll be on the pace pretty quickly. I could go on and on about all of the crazy things that happened at the Sweet 16 2.0, and I know I’m leaving out plenty already. Heck, at one point on Thursday evening I think the X275 record was re-set three times over six or seven pairs of cars. But I think the way to sum it up is to simply use the words of promoter Donald Long. He promised everyone that we would be able to Come Witness History, and that’s exactly what happened. He, along with the Radial Vs. The World and X275 racers, gave me—and everyone else in attendance and viewing online—a race weekend we’ll never forget. I’m already signed up to cover the next one!